Despite us being primarily located in the circles of Bassline and Garage music, we are always keen to explore the genres in surrounding areas, such as Grime, UK Funky, Breaks and whatever else we feel floats the boat as it were. We are very excited therefore to bring you guys the premiere for this brand new heater from ‘Zerg’, who has been causing quite a stir in the dubstep scene as of late, gathering support from the likes of Rapture 4D, Bukez Finezt, Sukh Knight and a host of other dubstep heavyweights. As a producer, Zerg as been active since 2009, constantly learning and expanding his sound, taking influences from classic dubstep dons, most notable of these being Cyrus, the GetDarker and Chestplate veteran. As the head of respected dubstep imprint: Subquake, it’s clear that Zerg is interested in all aspects of the 140 scene, however we are here to talk about his production more than anything else. 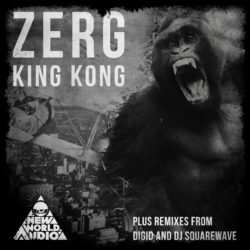 Despite being a bit late to the party, we are very keen to take a bit more of an in-depth look at ‘King Kong’, as it most definitely represents the solid state of dubstep in it’s current form. The title track itself is somewhat of a bassy weapon, shifting from a minimalist, gnarly introduction section to a gritty, LFO lead breakdown, which breathes through it’s metallic drum sounds and robotic melodic structure. This one also comes complete with two very exciting remix additions, coming from both Squarewave and Digid, two producers that in dubstep circles require very little introduction indeed. We check out the vibrant metallic stutters and gloomy horn melodies of Squarewave’s rethink first, before diving into Digid’s very well thought out overhaul, focusing on more complex LFO patterns and glitchy inputs.